60 calories a pop and clearly labeled. There are also mango, banana, raspberry, tangerine and pineapple flavors. I decide to try the strawberry first. It's got a pretty good initial flavor, but the bit of added lemon gives the whole thing a bit of balsamic like bite. At first the strawberry was hitting me as pretty sweet, but as I proceeded, that seemed to fade to a more mild flavoring (maybe my tastebuds started to freeze over?). Considering this is real fruit and not flavoring, I was a little surprised not to see any strawberry bits or seeds mixed in (they must have some high end puree machines). The texture is surprisingly dense. I know fruit (water) pops tend to be denser than something with a little cream in it, but the density seems a little tough in such a large form factor. Ahhh, maybe I just got a little spoiled by the thinner size of fruit dips. My son is with me now and we try the chocolate. He starts first and says he really likes it. I dig in and yeah, it's surprisingly good. It's still a dense treat but for the first few minutes, I couldn't even tell this was a banana cocoa mix. Yeah, that's right, the ingredients on this one are basically banana, cocoa, water and sugar. It's a pretty neat trick to be able to mask the banana flavor on most bites. My son is going pretty slow so I try to take his lead and savor the treat rather than biting it like I tend to do. Yes, you can tell water is one of the ingredients instead of milk, but I am surprised as how well it's working in bar form like this. The only mild downside is that the banana pops through just a little, but honestly, that's not fair to call it a downside. My son decides he's done for now (he tends to do that with popsicles, especially the large ones) but I keep going until the end. I don't know if I would crave this, but I do find it amusing that the banana flavor is so subtle. Neat trick Chloe's. 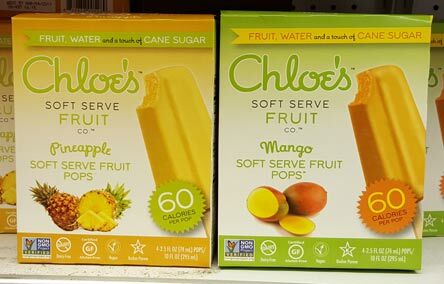 My only question to Chloe's is would they consider going with more of a popsicle size treat as I would have been fine with something half this size. >>>Wait, I just had a realization as I'm cutting up the photos for this review. The name is "soft serve fruit pops". Ummm, yeah, no. No part of this reminds me of soft serve. Sorry. It had to be said, though I get they started as a soft serve fruit establishment and they continue to serve actual soft serve fruit. I just fear that anyone unfamiliar with the brand might get confused. On Second Scoop: Let's take out a minute to point out my foolishness on the first sampling here. I went back to the strawberry and though this may sound obvious, you really need to savor these because that's when the flavor really comes out. The strawberry is fairly potent, but if you want that because you are tired of sweeter pops, this is definitely the way to go. Definitely feel free to give these a try, but go slow! 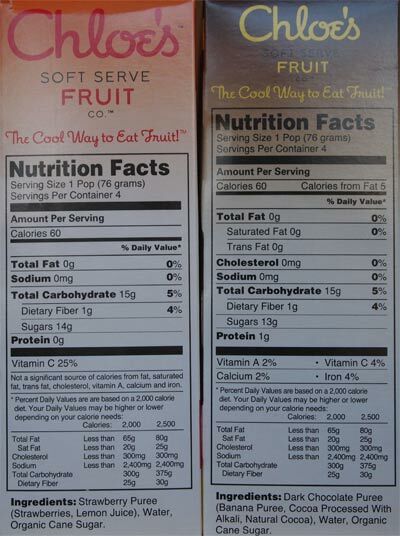 Why the chocolate box states "fruit, water, and cane sugar"? Is chocolate a fruit??? Definitely not soft serve, but my husband and I love the mango flavor. 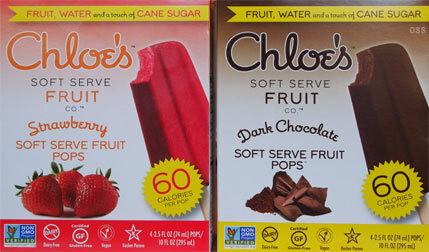 It's not too sweet (no chunks of fruit), but at under 100 calories a pop, it's a great nighttime treat. @Eva: is it like a froyo place that has a toppings bar? Or more like a red mango maybe? i think the soft serve is part of the company's name. They have soft serve stores here in NYC. @Anon: thanks for the confirmation! I was trying to point that out in the review but I'll do a better job of it. @Dubba Oh, I see that now, sorry for the redundancy. They are more like a froyo bar, not smoothie/drink based. Would you like me to send you a photo? How does it compare with Edy's Outshine fruit bars? Don't think they have chocolate, but they have mango, grape, pomegranate, strawberry, raspberry, tangerine, pineapple in our local grocery store. Very sherbet-like in consistency. Used to have ones based on coconut water by itself or with banana or pineapple (miss them). By the way, my small Vita-Mix blasts strawberry and raspberry seeds to microscopic smithereens, so it's not hard to get no seeds with any high-power blender that is comparable. But they also might just strain it well. @jwoolman: give me a chance to pick up a box and compare, it's been too long since I've had outshine bars. I bought the raspberry and pineapple the other day and didn't like them at all. From the name Soft Serve I expected the bars to be somewhat soft and they were hard as a rock. I had to let it sit out for several minutes before I could eat it for fear of breaking my teeth, and it was still hard. I get that they're supposed to be less sweetened than other brands, but I think they needed just a touch more. The pineapple ones tasted like canned pineapple juice, and are missing the chunks of pineapple that I like so much in the Edy's Outshine bars. I know that Soft Serve is part of the brand name, but the consumer expects that to also mean something about the product. It's a total misnomer, they should be called hard as rock try not to break your teeth bars. I am now addicted to the chocolate ones! but I can only find them at safeway, any other stores anyone knows of? and 60 calories! Where can i buy the mango pops other than NYC? I saw these in the ice cream section of my local grocery store here in TX. 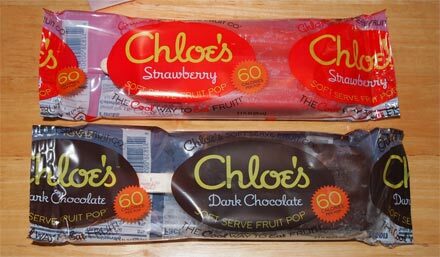 I normally just throw a box of "Fudgsicle Pops" in my cart and call it a day, but noticed Chloe's Dark Chocolate Fruit bars. What caught my eye was that they were only 60 calories so I decided to give them a try. I liked it !!! What I liked about it is was that you have to eat it them slowly and are able to savor the taste because they are so hard to bite into. 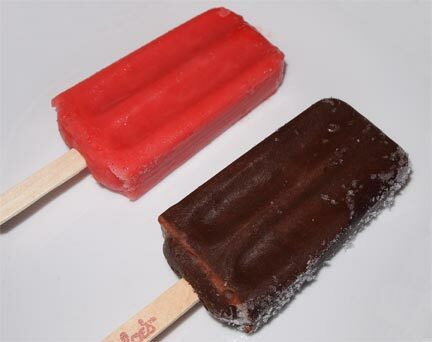 Normally when eating my Fudgsicle, it would be gone within minutes because they are so soft I eat them quickly and then leaves me with a sense of wanting more which meant eating 2 in one sitting. : ( I will definitely buy Chloe's brand again.